I'm just finishing off a hall table, and I should be able to start on Book 3 next week. 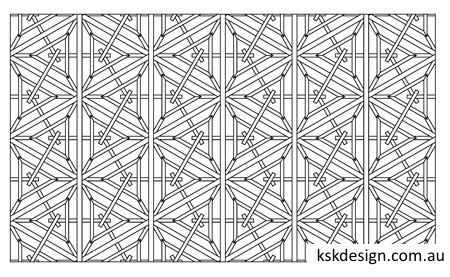 The new book (and a planned Book 4 following this) will cover kumiko patterns. The vast majority will be hexagonal patterns, and will be highly advanced. All the hexagonal patterns in Book 2 were structured within their own triangles to form the hexagonal shape, but most of the patterns in this book intersect the jigumi, and this raises the level of difficulty significantly. The following diagram is an example of the types of patterns that will be included in Book 3. This pattern is called the Kikyō tsuno kikkō, and it is one of the more complex patterns, but by no means the most difficult. And if you thought cutting the mitsu-kude (three-way) joint was difficult, probably in Book 4 I'll introduce the tombo (or tonbo — dragonfly) pattern. This pattern incorporates the yotsu-kude (four-way joint), and will be a tremendous challenge. I'll put the patterns up on the website as I complete them. Similar to those in Book 1 and Book 2, all patterns in this book can be made with normal tools and jigs. No specialist tools will be necessary.